Drive profitability, productivity, and accountability To create extraordinary lives, we must learn to "unplug" from the constant barrage of disruptions and "plug in" to the tools, strategies, and mindsets that allow us to harness our attention to reach our highest potential--and this book shows you how. 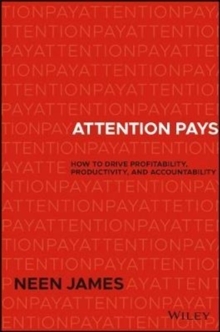 Attention Pays spotlights on the power of attention and absolute focus. Personally WHO we pay attention to. Professionally WHAT we pay attention to. And Globally HOW we pay attention in the world--and to the world. In an on-demand, 24/7 society, where distractions cost millions of people productivity, profitability, relationships and peace, it's time to pay attention to what matters most. - Includes powerful tips and tricks increase profitability - Shows you how to achieve maximum accountability and results - Provides strategies to help you productively manage daily tasks - Offers guidance on improving your daily attention and focus If you're ready drive profitably, increase productivity and boost accountability, it's time to tune out the noise, focus on what really matters and learn how Attention Pays.